I’ve spent the last week thinking about how to write about Tooey’s successes and failures in the hunt test game. She ran 6 hunt tests in April: one almost pass, one spectacular pass, one failure in a very difficult test, and 3 utter failures. I went to watch the last two hunt tests. It looked to me like every ounce of enthusiasm had been wrung out of her. She marked the birds’ falls well, but barely moved out at a trot, avoided water (which is amazing, considering how much she has loved water in the past — see here, here, and here), and gave up hunting way too early. This after 5 long months of training. And it means I’ve got some thinking to do. Maybe this just isn’t Tooey’s game. If this is the case, then I need to find something else for us to do together. But going this route wouldn’t be easy for me. Because this is a game I want to play. I’ve been watching Russ and Cooper for 1.5 years now, and I’ve been waiting for my turn. So maybe it’s something else. Some folks have suggested that the problem is that her hunt training was done using an e-collar. But I don’t think that’s it. I watched that training, and I could see that the pro used the collar carefully and fairly. I could also see that Tooey understood that she could turn it off and didn’t resent it. I think the problem is that she’s not a kennel dog. During the first 6 weeks of her training, I was asked not to visit. During the next 8 weeks, I attended her trainings, watching and learning at least once a week. Those 8 weeks were a joy. I saw 125 yard marks, 200 yard blinds, and happy splashing through the water-filled ditches. I saw her find her birds, pick them up, and deliver to hand. During the last 6 weeks, though, she was in California with the pro, so I didn’t get to see her at all. And during that time, her performance steadily diminished. My working theory is that that is the problem: she was away from home and away from me. So — what to do now? After five months, Tooey is finally home. She arrived on Sunday, and as Russ pointed out in a Facebook post, it took her about 29 seconds to re-establish herself as Queen Bee. She also seems very, very happy to be home. And Cooper is glad we’re all together. Of course, a few things will be (and have already been) different. She’ll be expected to heel on command on our walks. We’ll be out field training several days a week. And we have a new rule: dogs stay on their rug while the people eat dinner. It’s all good, and we’re hoping it will get even better. All of us a happy to be all together again. 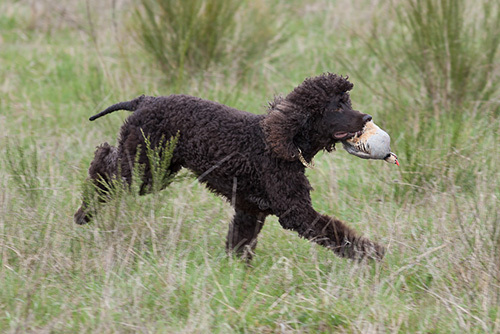 Thanks to the successful efforts of the Irish Water Spaniel Club of America in petitioning the AKC, our dogs are now eligible to run Spaniel Hunt Tests as well as Retriever Hunt Tests. 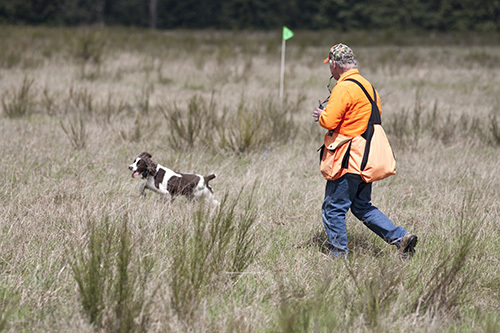 One of the first Spaniel hunt test in which IWS will able to run is scheduled in just a couple of weeks. This means that Cooper and I are on an accelerated learning curve to understand the protocols, rules, and techniques of being a real Spaniel. 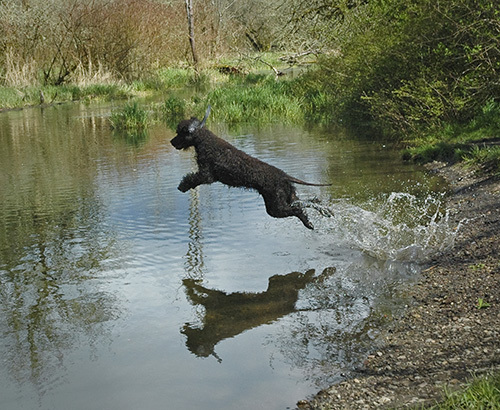 This last weekend, the Mount Rainier Sporting Spaniel Association, a western Washington dog club, hosted a training day at the Scatter Creek Wildlife area (midway between Seattle and Portland). We met up with a number of friends and their curly brown IWS who are also on task to work their dogs in this new venue. This includes Rod and Renae with Rio, hunting partners and hosts for Washington pheasant and quail. Christine with Riki and Monty, her Realta and Whistlestop boys who are cousins to Cooper. And Tammy, who is handling Mowgli, Cooper’s brother. I made a number of photos at yesterday’s training session of our dogs working the hunt test scenarios. I was fortunate that Christine took photos of Cooper while I was busy with a whistle in my mouth and waving my arms as I attempted to direct him through the course. 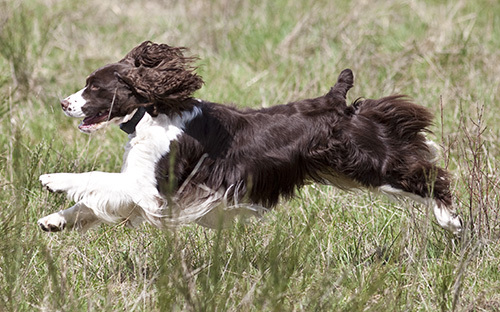 Here is what you would typically see at a Spaniel Hunt Test: Springers zooming at full speed through the cover in search of birds. The highlight of the day was watching Mowgli, Cooper’s brother. Mowgli is well known for his sweet disposition and good looks, but he has not expressed a strong desire to disrupt the balance of nature and reveal his primal prey drive. Yesterday, however, he discovered chukars. 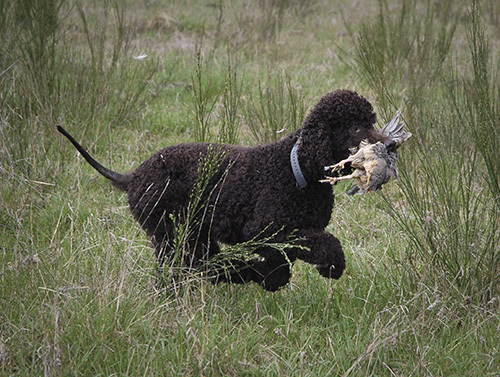 Mowgli made an effort to help the gunners save on ammunition — he was determined to find, flush, catch, and retrieve the chukars without any help. No shots were fired in Mowgli’s training session. He did all the work. Now if he could learn to cook, then he would be an all around hunting dog. Christine made the images below of Cooper as he flushed the birds. He watched the bird get airborne, marked its fall after the gunner brought it down, and then did the retrieve after I released him with a voice command. It was just like he knew what to do. All that retriever training has crossed over just fine. After lunch, we did a bit of water work at a drop-dead-gorgeous section of Scatter Creek. (Thank you Spring for showing up.) The water Spaniels were in their element. Below are Cooper and his brother Mowgli doing what these dogs do so stylishly, the water entry. 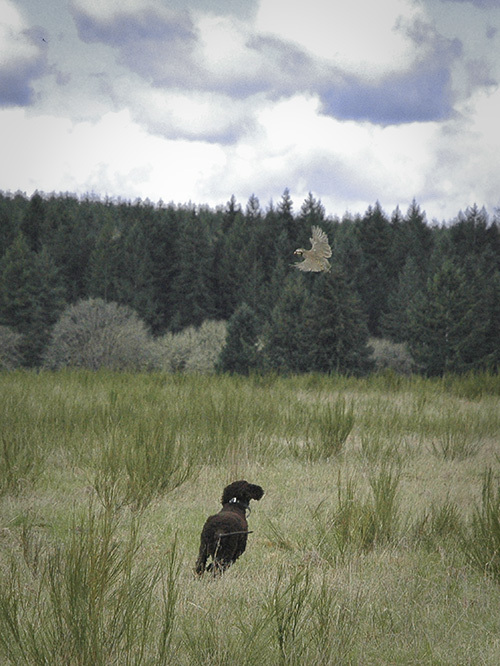 In just two weeks, we will be back a Scatter Creek for one of the first AKC sanctioned Spaniel Hunt Test that will allow our curly brown dogs to compete. We’ll see if they can shine as brightly as they did yesterday. When someone fails a test, a logical assumption is that the testee was a poor student — didn’t study or practice well enough, didn’t apply himself/herself, is stupid or lazy, didn’t care, had a bad attitude, something like that. But when I was learning to be a teacher, one of my instructors made a comment that has really stuck with me. He said that if too many of your students fail a test, then the first thing to ask yourself is: Did I design a bad test? At yesterday’s hunt test, enough dogs failed the Junior test that the test committee reportedly received a considerable number of complaints — more than you’d expect through just sour grapes. 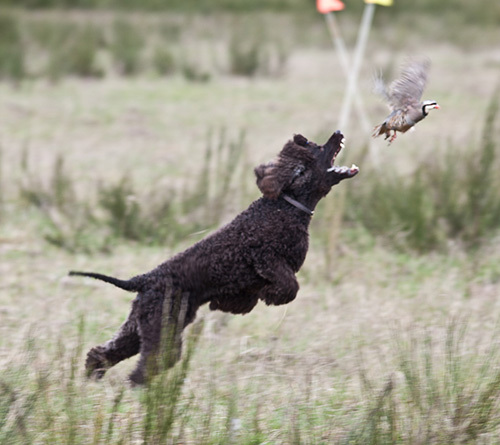 In most Junior tests I’ve gone to, the birds fall into open land or water, so that the dog can see the bird when they get close. 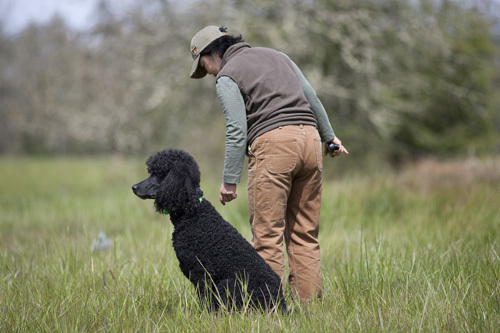 Often, the dog has to go through or over something — like a patch of tall grass or an island — but once they get to the bird, they’re able to see it. From what I heard (and I wasn’t there, so this is second-hand), the land birds landed into cover — tall grass or brush. Tooey marked and retrieved both of these. Good girl! The first water bird landed into a small cove that was tucked up behind an island. It was so hidden that the dog at the line couldn’t even see the splash. That’s the bird that Tooey couldn’t find. The second water bird fell into a tall patch of reeds, but because Tooey had come back to Butch without her first water bird, she didn’t have the opportunity to go out after the second. But the way this test was designed so that the birds were hidden does make one wonder if these Junior dogs were taking a Senior-level test. So… Tooey was one of the dogs who failed. I am very disappointed in the result. But the good news is that her attitude was good, she did find and bring back two birds, and she really put in the effort. I’m proud of her for that. Bev Higgins, of Parkdale Kennels, called to tell me that Tooey ran a perfect Junior hunt test today. What made it even better was Bev’s description of how happily and enthusiastically Tooey worked for all four marks. I wasn’t there (darn it! ), so I have to report what I was told. The facts will probably be mostly right, they just may not be in the right order. And no pictures, either. The weather in Anderson, California for today’s Lassen Retriever Club hunt test was warm, with no wind (thank heavens). She was again handled by Butch Higgins, her trainer. There were, as usual, two series: the morning’s land series and the afternoon’s water series. The land series included two birds, one of which was a live flyer. Both birds came down at about 100 yards. For each of the two single marks, Tooey apparently marked the fall, went straight out to the bird, and came straight back. Bev even described her as having “stepped on the bird.” That’s a common hunt test phrase that means the dog nailed it: going out to exactly where the bird landed and not having to hunt around looking for it. What’s even more perfect is that Tooey did this twice. Oh, good girl!!! The water series also included two marks. It sounds like both birds were thrown from a peninsula that went into the middle of the pond. The first bird was launched for a 75-yard mark into the water (I think). The second bird was hand-thrown for a 50-or-so-yard mark toward the shore of the pond. Really lucky dogs got a second bird that fell into the water with a big splash (which makes it easier to see), while unluckier dogs got a duck that fell onto the land at the edge of the pond. Tooey’s second bird landed in between, so there was a little splash. And she did it again. Went right into the water, swam briskly to the duck, grabbed it up, and brought it right back. On the second bird, she did the same — and what’s great about this is that she resisted the temptation to get out of the water and shake off before fetching the bird. Tooey just grabbed it up, turned around, and swam back to Butch. One of these four marks (I don’t know which one), Bev even said that Tooey came back with her duck, sat prettily into a perfect heel position at Butch’s side, and raised the duck up to deliver it to him. A perfect hunt test. And Tooey’s first orange ribbon! Good girl, my sweet Tooey darling! Let’s hope for/pray for/wish for/meditate on another ribbon tomorrow. 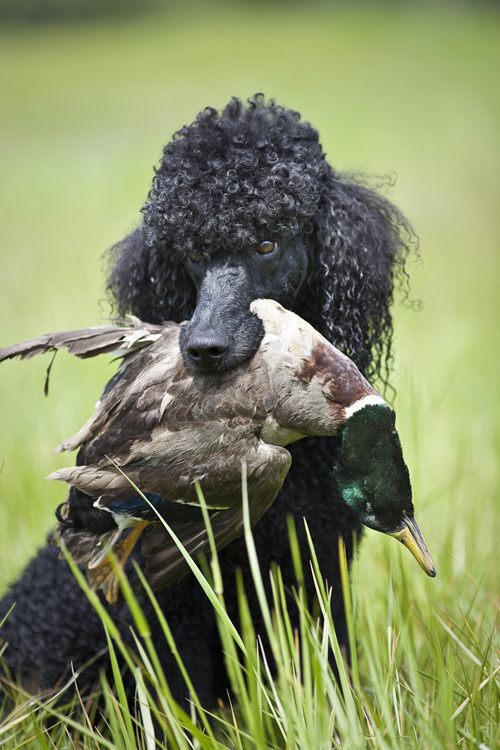 If you have never been to a retriever hunt test, especially in the western United States, then you probably have not seen a unique slice of dog culture that is every bit as strange as a dog show arena filled with hundreds of well groomed dogs running in circles with well dressed people at the end of the leash. When I attended my first hunt test as a spectator (Cooper was but a wee pup), I was not quite prepared for the high density of camo clothing, 4×4 trucks, and hundreds of swaggering black Labrador Retrievers. When I pulled into the parking lot in my own 4×4 truck, I found a vacant spot next to a small Toyota sedan. 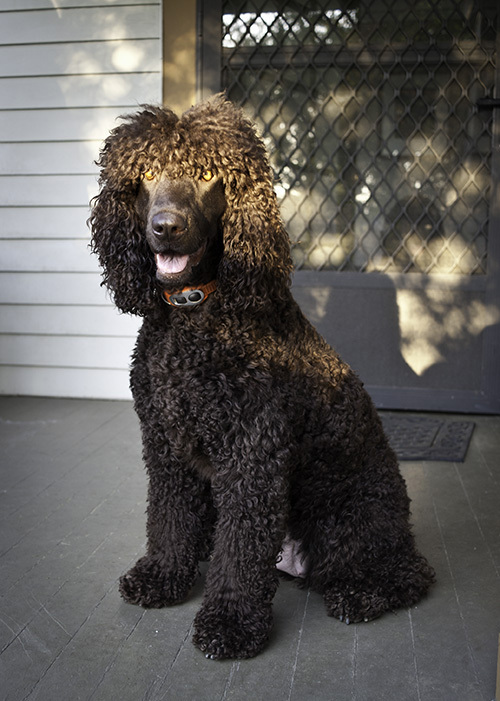 And sitting quietly in the back seat was a nicely groomed standard Poodle. As I stepped down from the cab of my truck, I half jokingly asked the lady next to the car how the Poodle did during the morning’s test. She replied. “He aced it!” Being the new owner of a curly brown dog in the midst of Lab culture, I thought that I better take note from the success of this unconventional retriever team that I was parked next to. Fast forward two years, and Cooper and I were now ready to start on our quest for a Junior Hunter title. We had the opportunity to practice at a “picnic test” that Spring, and coincidence had us park next to the very same car with the very same Poodle in the back seat. 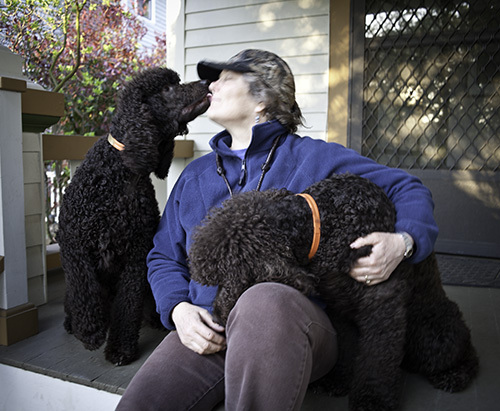 The Poodle, Trip, and his owner-trainer-handler, Janice, became friends, mentors, and training partners from that day. And that is best part about this subset of the dog culture: the people, their help, the experience they are willing to share, and their inspiration. Janice totally understood the nuances of training a non-Lab for Lab sport and had lots of advice and support for Cooper and me, both total rookies at the time. By this time, Trip had his Junior Hunter title and was well on his way to earning a Senior Hunter title. Cooper and I continued to train with Janice and Trip for the rest of the summer. 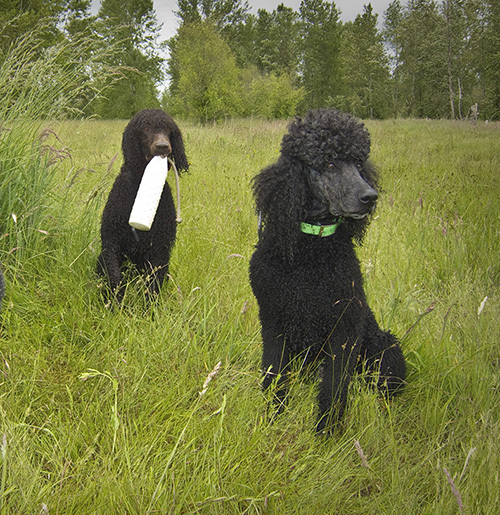 Wednesdays became known as “Poodle Day” as Cooper and I joined up with Trip and another Poodle every week for retriever training. Late last Fall, Trip was diagnosed with canine cancer and was not able to complete the last of his hunt titles. However, this past Winter, I was fortunate to spend a couple of afternoons with Trip, making some portraits. All dogs are wonderful, some dogs accomplished, and some are handsome. Trip was all of this and more. 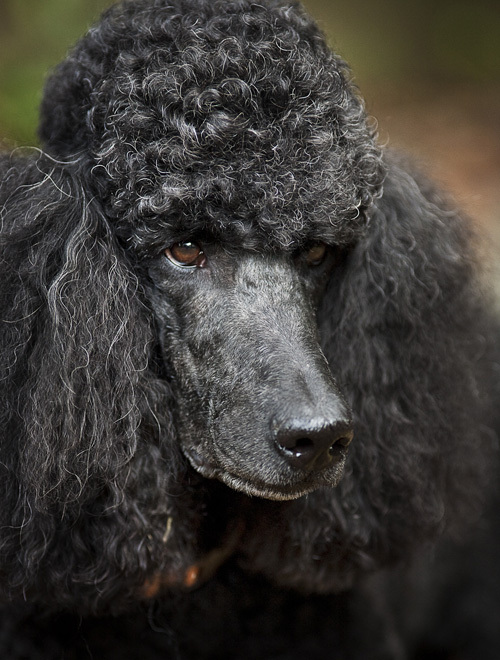 Sadly, Trip is gone now, and Wednesdays haven’t been Poodle Day for awhile. But the friendship of Trip’s partner continues. This is one of the best parts of this odd dog culture Cooper and I have come to enjoy. We have added a great number of friends into our lives in the last 4 years since Cooper entered our life. 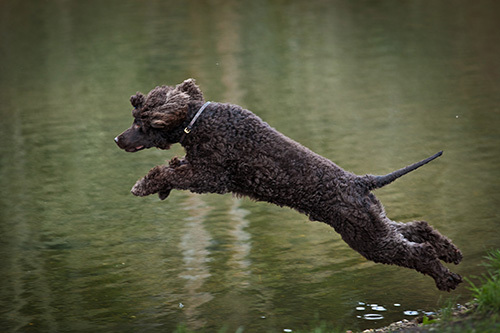 Lots of folks with curly water dogs, and lots of folks with athletic Labs. Behind all that camo is a delightful group of people that we have come to know as friends. The dogs are great, but it is the people behind those dogs that make them great. And this year’s picnic test? 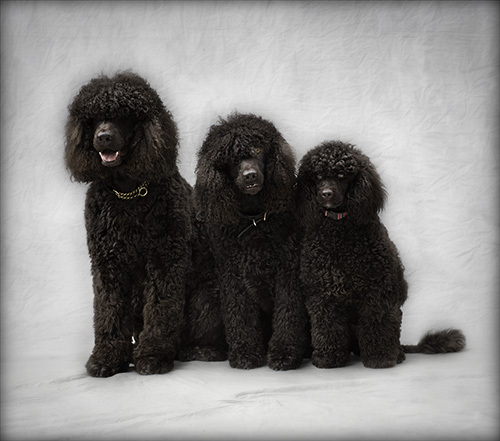 Yep, we found Janice again and met her new Poodle pup, Enzo. 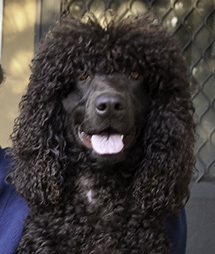 Cooper and I are looking forward to future Poodle Wednesdays. Cooper is not a dog who wants to be left out of the action. Yesterday afternoon, I set up to photograph portraits of dogs that belong to some friends of ours. Always eager to participate, Cooper immediately ran to the center of the seamless studio background and struck up a pose. That allowed me to check focus, lighting, and exposure. Not only is he a great hunting dog, he is quite the photo assistant as well. Today’s work involved editing yesterday’s photo shoot on the computer. Cooper couldn’t stand being left out of the action this time either. So he took up his normal office position of sitting on the side chair. 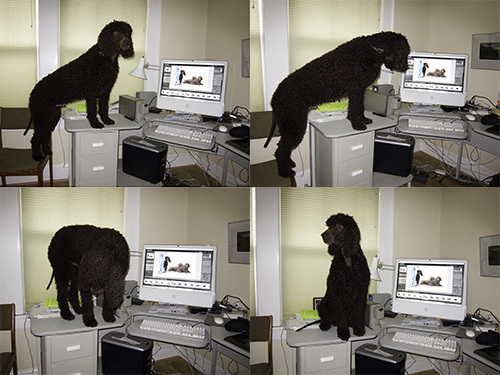 But rather than dropping a ball in my work space as he has before (see the bottom photo of this post), he just moved right in. To put this in scale, Cooper weighs in at 65 pounds. But heck, he knows what he likes. 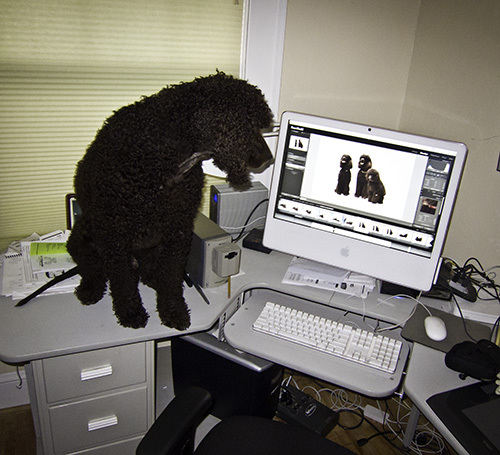 The photo of the cute female Irish Water Spaniel must have gotten his attention.